JAMAICA, Queens (WPVI) -- After more than a week on the loose, the rogue cat who escaped her owner at JFK International Airport has been rescued. 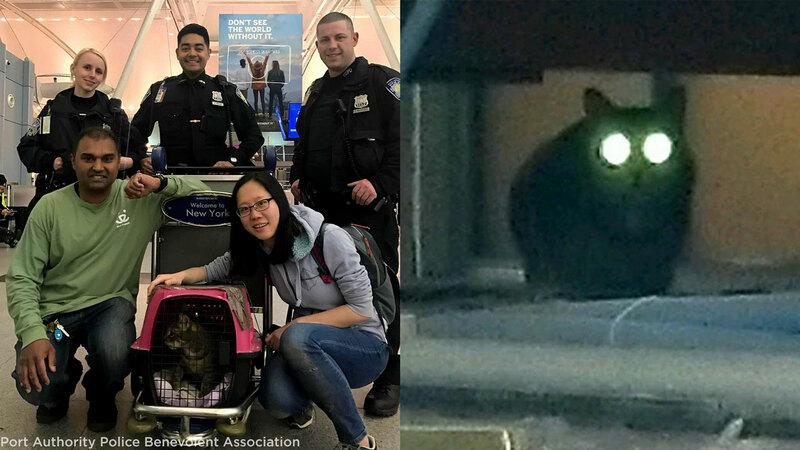 Pepper the cat was rescued by Port Authority Police with the help of Pepper's owner's friend and many others.at approximately 1:45 a.m. Saturday. The 4-year-old tabby had bolted from her owner at Terminal 4 on April 20 as they were preparing to board a flight to China. Pepper then made her way into the terminal's interior superstructure that is not accessible to humans. The owner, who was moving to China for a new job, was devastated to leave Pepper behind. Since her escape, Pepper was spotted several times during the overnight hours. Port Authority Police employed several tactics to lure the cat, including setting up safe traps with food. But on Saturday, Officer Kameel Juman, who led the week-long rescue effort, enlisted the help of Nuan Tang of Jersey City, a friend of Pepper's owner who had cared for the pet. Pepper immediately recognized Tang's voice when she called her by her Mandarin name, Dai Meng, and enticed her with food. Officer Juman and Tang were then able to grab Pepper and place her in a carrier. Tang will now find a way to reunite the owner with her cat.